For customers of online banking company Simple, making purchases this week has been anything but. The two-year old startup, which was acquired by Spanish bank BBVA earlier this year, was performing scheduled maintenance from 11 p.m. Tuesday to 6 a.m. Wednesday (PST). But for some users, the outage lasted far longer. The company, which has 120,000 U.S. customers, said 10% of accounts weren't upgraded in the seven hours allotted -- meaning those customers were essentially locked out of their accounts for 24 hours. And unlike with traditional banks, Simple customers were unable to use their debit cards during the outage. "We sent two emails in advance of the downtime, gave ample lead time, and suggested that [customers] keep an alternative payment on hand," said Communications Director Krista Berlincourt. But this wasn't enough for many users, who took to Twitter to express their frustrations. They didn't mind the maintenance itself (which is also typical of major banks) but the fact that their accounts weren't restored when Simple said they would be. 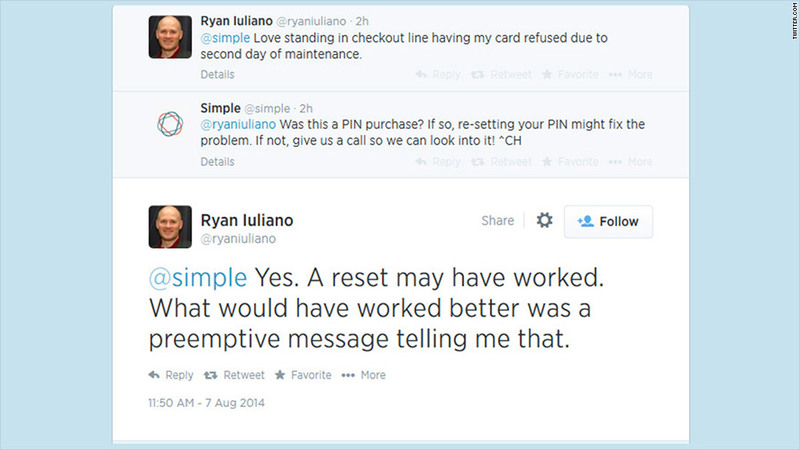 Ryan Iuliano was among the 10% of users whose accounts didn't update within the planned maintenance period. On Thursday, he went to buy lunch and was prompted to reenter his pin code. When it still didn't work, he used another card. "It's embarrassing, you've got people behind you and they think you're an idiot," added Iuliano, who has been using Simple as his primary bank account for the past several months. Frustrated by his experience with Bank of America (BAC), he turned to the startup that touts itself as a "no worries" banking solution. He took to Twitter -- where the company has over 39,900 followers -- to relay his experience. Still, Iuliano has no intention of leaving Simple, noting that until now, "everything's worked as advertised. I love the software, the money-managing aspect." Berlincourt said all affected cards should now be functioning. She said she can't speak to individual disruptions, which could be "a result of overdrawn funds." "People freak out and they always think it's the banks' fault," she said. Ron Shevlin, senior analyst at Aite Group, says that while it's certainly an annoyance, it's not a "systemic risk." "People using Simple are looking to get away from larger institutions," explained Shevlin, "Every once in awhile there's going to be a glitch. 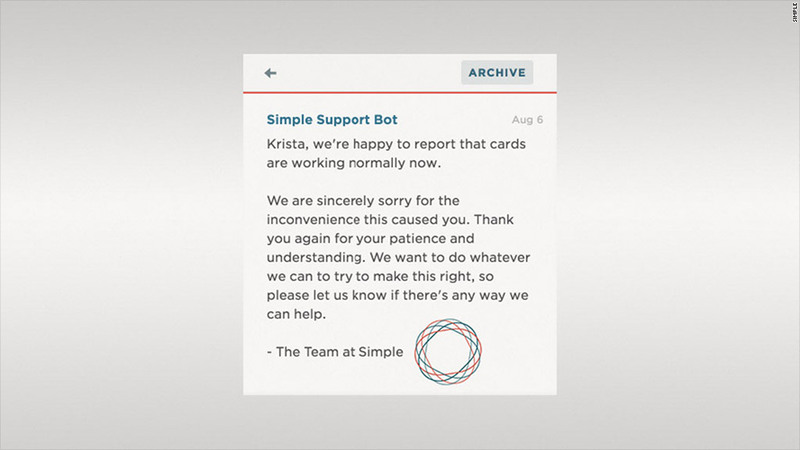 The downside with an online bank like Simple is that there aren't physical locations to walk in and take care of a particular issue." Still, Bobby Sankary, who runs his checking account through Simple, is especially frustrated because he's currently traveling in Barcelona. "It put a terrible bind on people like me out of the country," said Sankary. "I cannot get money out or charge anything. I tried calling them on my cell and no one is available. I feel like the CEO needs to come out and publicly apologize to us. Not sure how a simple maintenance/upgrade could go so wrong."